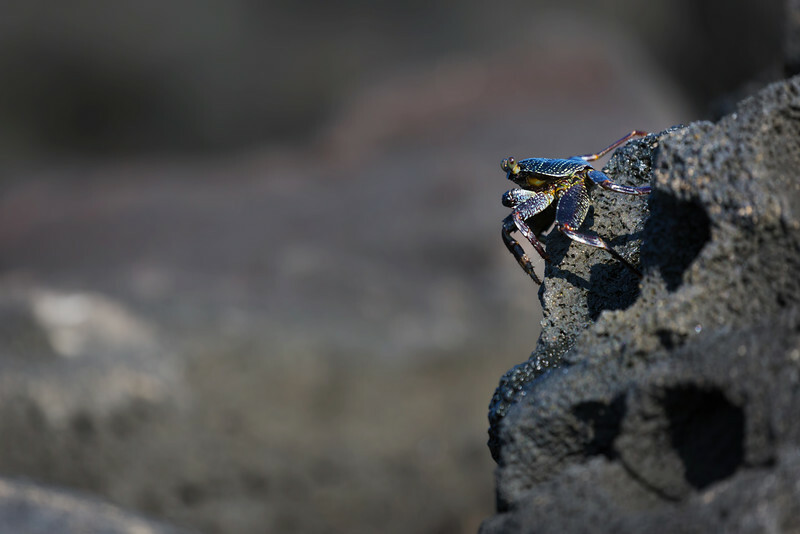 There is something entertaining about trying to shoot the crabs that dance around the edges of the rocks along a shoreline. No matter how slowly you approach them, they immediately scurry into the dark recesses between and under the rocks. You can try to treat them like rabbits: be like Elmer Fudd and whipser (“shhhhhhh…. Be very very quiet. We’re hunting rabbits”), but crabs are smarter than that. Sorry. The trick is not to try and sneak up on them, but to wait them out like you would when shooting birds in the wild. I.E., go find a nice spot where crabs are seen scampering around, and simply crouch or sit quietly with your camera raised until they come back out. Easy right? Yeah… except for that whole “ocean surf” part. I’ve gotten both myself and my camera wet a few times while doing just this, so do be careful. Waves, your camera, and slippery rocks don’t make for good companions. I have battle scars to prove it. I think it was shortly after that shot that the wave hit me. Ha ha. Ha. Drip. Maybe I should invent a crab shooting blind, where the tent is camouflaged like a rock and water proof? Don’t miss any of my other in-the-field stories by subscribing to my newsletter: http://www.capturedonearth.com/newsletter/. OMG! California has snow! But no water?? ?I’ll never finish this. And: I’m OK with that.